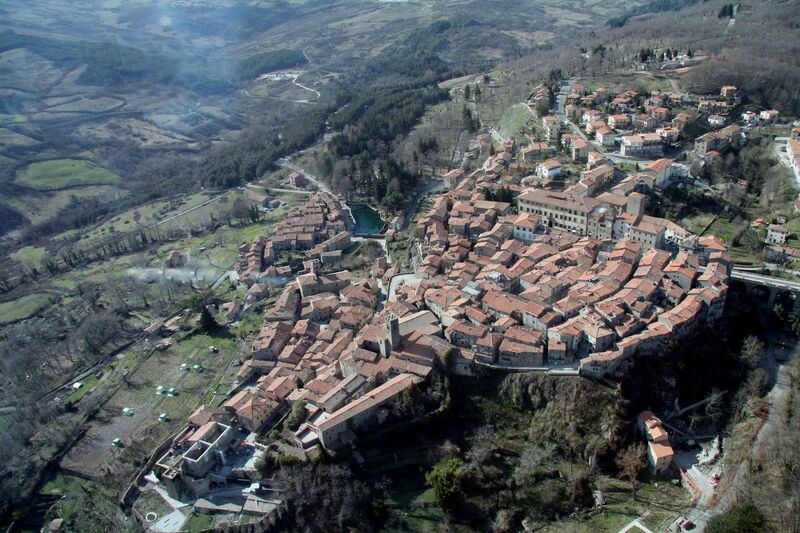 Sheltered on a cliff of volcanic rock, which dominates the spring of the Fiora river, the village of Santa Fiora has a different history unlike the other centres of the Amiata region. Indeed, the village was not subject to the rule of the Abbey of Santissimo Salvatore, but soon became the most important Amiata property of the Aldobrandeschi family, enduring numerous occupation attempts by the Sienese. In 1439, its ownership passed on to the Sforza family, before being taken over by Florentine rule in 1633. Once arrived at Santa Fiora, the traveller’s attention is instantly drawn to the imposing Palazzo del Conte, formerly the Sforza Cesarini residence, and now the offices of the town hall. The palazzo houses the intriguing Monte Amiata Mercury Mining Museum, dedicated to the history and techniques of mercury extraction, which strongly marked the area between the nineteenth and twentieth century. Once bypassing the palazzo (from the left side) or by crossing through it (via the arches), you find yourself in the square that is the real hub of the village. From here the discovery of Santa Fiora continues down Via Carolina, leading to the church Chiesa del Suffragio (1716), before descending to Pieve delle Sante Flora e Lucilla, the most important monument in the village. The parish, erected before the first millennium, was rebuilt in the thirteenth century and expanded in 1792 with the addition of the side naves. The interior hosts a collection of lovely terracottas credited to Andrea della Robbia. At this stage a descent to the actual borgo is in order, namely the enclosed part of Santa Fiora surrounded by ancient walls and overlooked by the dark trachyte mountain side. Here we find the Church of Sant’Agostino, founded in 1309 and adjoined to a convent, of which only an arched doorway from 1473 remains. In the borgo you can still admire the Capuchin Convent, established in 1601 and closed in 1991, associated with the cult of the Miraculous Crucifix and the Procession of the Logs. Passing through the Porta del Borgo, you enter the terziere of Montecatino, and then Peschiera, an evocative little lake that collects the waters of the Fiora. The traveller will also be left amazed by the nearby small Church of the Madonna della Neve (also known as “of the Pescina”), of humble appearance but ornate in delicately conserved frescos attributed to Francesco Nasini. The main peculiarity of this chapel is its unique floor, covered in glass panels through which you can wonder at the source of the Fiora, as it gushes just under the surface level. In the vicinity of the hamlet of Selva, surrounded by a wonderful forest, the Convent of the Holy Trinity warrants a visit. Inside, the convent treasures a Della Robbia crucifix and a series of exquisite paintings, while the eighteenth-century cloister retains a dragon’s head, left by an early traveller.